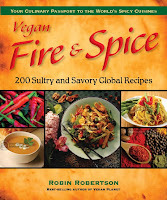 I’m very pleased to announce that my latest book, Vegan Fire & Spice, is now in its third printing. Also, the book has recently been picked up by Barnes & Noble, both the box stores and online. I’ve been hearing from people (thanks for writing!) that they’re especially enjoying the recipes now that the weather has turned cooler, and I have to agree. At the risk of sounding like an infomercial, I hope you’ll keep Vegan Fire & Spice in mind for gifts this fall and in the coming holiday season. You can order the book at a discount through my website Global Vegan Kitchen or Amazon, or ask your local bookstore to order it for you through Baker & Taylor distributors. It’s also available through Cosmo’s Vegan Shoppe, Herbivore, Sidecar for Pig’s Peace, PETA, and many other stores that sell vegan books and products. This delicious West African soup is moderately spiced with curry and cayenne but mellowed by the sweetness of apple and the creaminess of vegan yogurt. Add less cayenne if you want a milder soup. The recipe is from Vegan Fire & Spice. Heat the oil in a large saucepan over medium heat. Add the onion and celery, cover, and cook until softened, stirring occasionally, about 5 minutes. Stir in the curry powder and apple and cook 2 minutes. Add the broth and apple juice and simmer for 10 minutes. Remove from the heat to cool slightly. Transfer the mixture into a blender or food processor. Add the vegan yogurt, cayenne, and salt, and puree until smooth. Pour the soup into a large bowl, and refrigerate for 2 hours or until cold. Serve chilled, garnished with the minced parsley. The summer veggies in our garden have given way to the wonderful fall crops that we’re already beginning to pick. 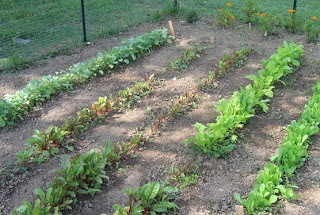 Rows of kale, chard, and endive are still at the “baby” stage — making them all the more tender to enjoy. We also planted Buttercrunch lettuce and Butternut squash — the only “butters” you’ll find in this house! That first touch of autumn in the air makes me want to make warming fall-weather food, so I paged through Vegan Fire & Spice and found lots of recipes ideal for the cooler weather. I decided on the Chickpeas and Sweet Potatoes because its colors remind me of autumn, it’s easy to make, and the flavor is wonderful. Just before serving, I added some of that tender baby kale from the garden (lightly steamed) and served it over brown basmati rice. Below is the recipe as I adapted it. Recipe adapted from Vegan Fire and Spice by Robin Robertson © 2008, Vegan Heritage Press. For a variation, add a teaspoon or two of curry powder. Steam the sweet potatoes until just tender, about 20 minutes. In a large saucepan, heat the oil over medium heat. Add the onion, turmeric, cumin, cinnamon, and cayenne. Cover and cook for 5 minutes, stirring occasionally. Stir in the water, reserved sweet potatoes, chickpeas, tomatoes, and salt and pepper to taste. Cover and simmer until the mixture thickens and the flavors are blended, about 15 minutes. To thicken the liquid, blend about 1 cup of the mixture in a blender or food processor until smooth, then stir it back into the saucepan. Taste and adjust the seasonings. Stir in the kale and serve over rice. Calling all fabulous animal loving & green artists & fashion designers! 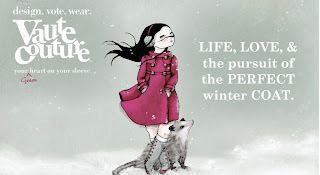 Through October 7th, Chicago conscientious fashion newbie, Vaute Couture, Inc. is having a fashion sketch contest to inspire their first line of vegan- eco - glamorous winter coats! 3 Categories, and 3 $1000 Winners. Open voting scheduled for October 14th-21st. Also, profits for one of the three coats will go to the Farm Sanctuary! You can enter a fashion sketch & bio info to spec at their website, www.VauteCouture.com, click on How It Works for details & application. To stay updated, subscribe to their blog at www.OnOurSleeve.com, or contact Leanne@VauteCouture.com. Sketches need to be in by October 7th! We picked these gorgeous red bell and yellow banana peppers from our garden yesterday, and I had planned to stuff them with a salsa rice and bean stuffing and let them cook in my slow cooker. However, seeing that these adorable cherry peppers were ready, too, made me suddenly crave the stuffed cherry pepper appetizer my mother used to make on holidays and special occasions. The original family recipe calls for jarred cherry peppers and I’d never made them with fresh ones. 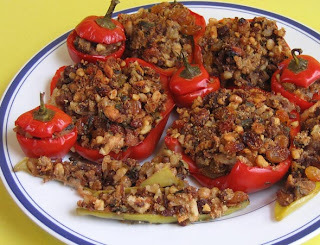 Since I wanted to make a stuffing for all three kinds of peppers that we picked, I adapted the recipe to add some additional ingredients to bulk up the stuffing and make it more of a main dish instead of an appetizer. The stuffing leans to the Sicilian with its inclusion of raisins and figs. I didn’t have any figs in the house so I left them out. The bright fresh pepper flavor was wonderful, from the sweetness of the red bells to the fiery heat of the cherry peppers, and the stuffing complemented them all. The peppers I used weren’t very big, so they made enough for the two of us for dinner with a little left over. If you’re serving them with something else, they’d probably stretch to feed four. If you have larger peppers, just add some more ingredients to the stuffing – you can also throw in some chopped mushrooms or white beans, if you have them. 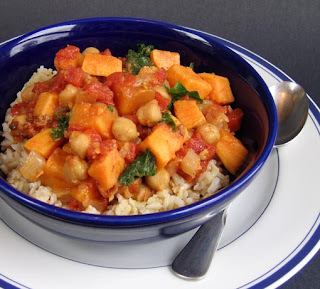 This recipe is adapted from Vegan Fire & Spice. 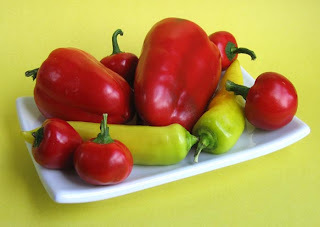 Use a sharp knife to cut the bell peppers and banana peppers in half lengthwise and slice off the caps of the cherry peppers. Remove the seeds from the peppers. Bring a pot of water to a boil and add the peppers. Reduce heat to medium and simmer for about 5 minutes to slightly soften the peppers. Drain and set aside to cool. Preheat the oven to 375°degrees F. Heat the oil in a skillet over medium heat. Add the garlic and onion and cook until softened. Stir in the bread crumbs, walnuts, raisins, parsley, basil, fennel, and salt and pepper to taste. Remove from the heat and stir in a small amount of water to help the stuffing hold together. Pack the stuffing mixture tightly inside each of the peppers and arrange in a lightly oiled baking dish. Cover and bake until tender, about 30 minutes. Remove cover and bake another 10 minutes to brown the tops.